Digga's new generation premium auger range is designed with the ultimate in performance, quality and cost effectiveness in mind. With the A6 range, you benefit from its 1 3/4 hex drive pilot over the square drive - giving machines with higher down pressure and higher torque greater strength. The A6 suits Skid Steers and Excavators up to 15 ton for drilling in earth. The A6 is a flat tooth auger with chisel ripping teeth on inner pockets. Ideal for general earth & clay drilling. With multi facet tungsten teeth fitted, granulated and soft fracturable rock conditions can be drilled. This auger has been designed with a double start single carry flight configuration. Its flight pitch is shallow for greater soil retention, and its heavy duty body allows for greater reliability in tough conditions. RC6 augers are available with a range of different teeth options to suit most ground conditions including earth, hard soils, shale, clay, and permafrost. 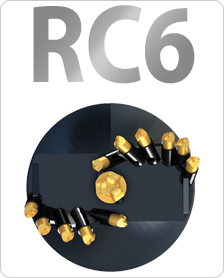 Basically, with the RC6, you get all the benefits of the A6 plus the superior penetrating ability of the B7 taper tooth head. 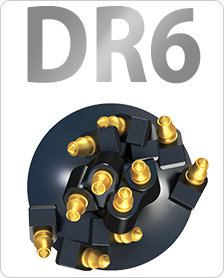 The RC6 comes complete with all purpose taper teeth perfect for combination drilling in all conditions - from earth to medium rock, providing a clean hole every time. RC6 teeth are easy to install and remove with Digga's ingenious knock in, knock out tooth locking system which eliminates the need to use extra tools to remove the teeth. Digga’s DR6 AUGER features rotating rock picks and is specially designed for drilling from soft fracturable rock to very hard rock. 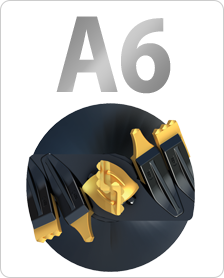 DR6 Auger also feature short flighting to encourage regular spoil removal, allowing cool air to enter the hole and facilitate regular inspection of Carbide Bullet Teeth.